The federal government is requesting six water guns for one of its endeavors against invasive carp species, but they’re not the plastic toy kind. According to a presolicitation, the U.S. Geological Survey is looking for water guns that weigh hundreds of pounds and run on compressed air, nitrogen or other fluids. According to the LaCrosse Tribune, some water guns can blast waves with a force between 1,000 and 2,000 pounds per square inch. NextGov reported that the guns they’re looking for were first used in seismic surveys. 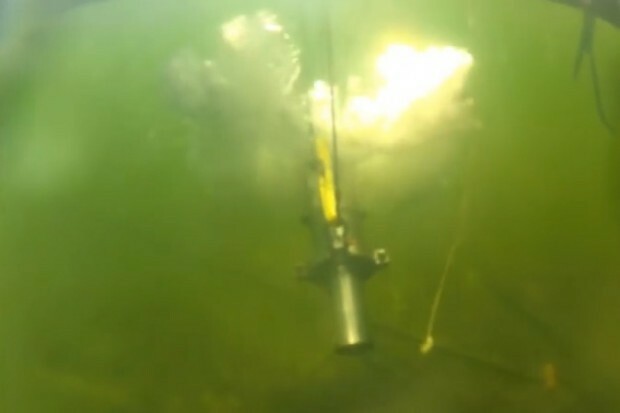 “Initially when seismic surveys were being conducted, people were using things like dynamite to provide that underwater explosion and shock to make a sound pressure wave and penetrate the Earth’s crust,” USGS research scientist Mark Gaikowski told NexGov. Later air gun technology was used, followed by water guns, which USGS says generates a “cleaner signal by eliminating the interference produced by the air gun.” The use of water guns for seismic exploration was then discontinued “because they were less efficient at producing low frequency energy, and there were concerns about their effect on aquatic life.” This latter fact is what led researchers to begin using the technology as a means of controlling invasive species, like zebra and quagga mussels and different types of fish that have made their way into Great Lakes waterways. 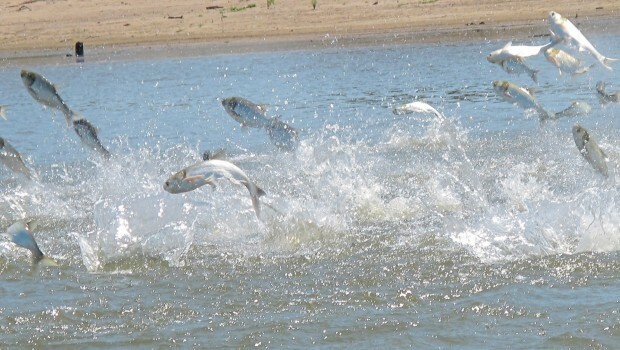 With the carp specifically, USGS said that water guns emit sound at frequencies Asian carp hear, in addition to pressure waves and two high velocity water jets. Gaikowski told NexGov they’ve already seen carp avoid areas where the guns are in use in pond experiments. The hope is that scientists will someday be able to keep the carp from spawning habitats, thus reducing the population from the start. “Silver carp and bighead carp use the water currents to keep their eggs afloat — that way embryos develop in the eggs as they’re floating down river,” Gaikowski told NextGov. While scientists are conducting experiments to curb the carp population in their own way, we can’t forget the Peoria Carp Hunters who have taken carp control into their own hands, using weapons that include tridents and bows an arrows.